Commentary: It's kind of remarkable to see how many analogs to The Empire Strikes Back there were in The Last Jedi. 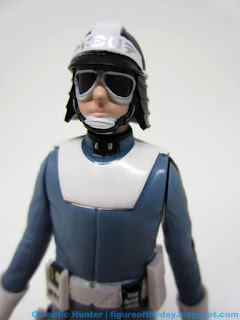 The Canto Bight Police figure occupies a position not unlike the Twin Pod Cloud Car Pilot of old, with a vaguely similar appearance and a vehicle that inspires about as much actual love. Nostalgia can do wonders for a toy, but it took forever for collectors to warm up to the orange vehicle or its peculiarly pastel pilot. 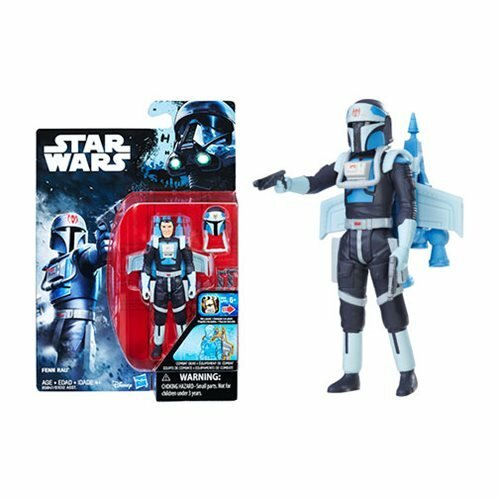 This new ship looks a lot like a jumbo version of Kenner's Security Scout Body Rig / Mini-Rig Vehicle, a hovering, standing room vehicle that doesn't really have an exciting form. The Canto Bight speeder is bigger, more colorful, and has firing rockets - but it's basically a big bare skeleton of a vehicle with a couple of pointy bits. We saw a few cops walking around Canto Bight, including some with capes, some with gambling problems, but none that really made an impact. 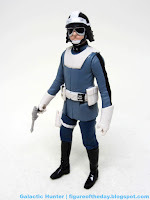 The pilot looks a lot like Bespin guard concept art, or like a cop out of an old movie in Monte Carlo. It does carry over some of that fancy Cloud City look, which feels like it came out of a sci-fi movie of old rather than the Lucas "used" Universe. This is a clean figure with a fancy white belt, a hip holster for his gun, and matching gloves. The hat has a band reading "CBPD" on it, and it's fairly well painted. There's a nice stripe on the shoulders, and it's sharp. It's just not true to the movie photos I'm examining. The movie shots - and I'll need to see the movie with a pause button to compare - looks like the hands are white, but the wrist part is a dark blue. It looks like there could be more gear on the belts, and the jacket doesn't open up below the belt either. Admittedly I'm nitpicking - but as I assume this will be the only version we ever get of the costume in toy form, it's always a little disappointing. It's also disappointing a troop builder is packed with a vehicle, but as an unpopular vehicle it's not beyond question that you can get the whole vehicle for cheap soon and shuck the rest of it to a thrift store. With the Force Link you get some great vehicle and blaster sounds, and some less great human clips. "Drop you weapons!" Eh. It's a good choice, but for Star Wars, it's all a little bland. The pistol fits nicely in his hand or holster, and the figure sits easily in the vehicle. It's functionally great, but this faceless figure is a bit forgettable. I'm sure Hasbro made it with the designs handed to them by Lucasfilm as perfectly as possible at the time, but I'm just kind of shrugging. 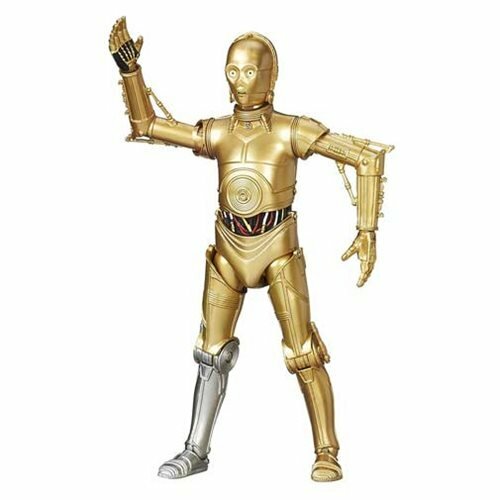 With tons of aliens, droids, and funky troopers, a faceless human that's lawful neutral is a waste of a slot on a short-run toy line with figures that barely made it to the finish line. 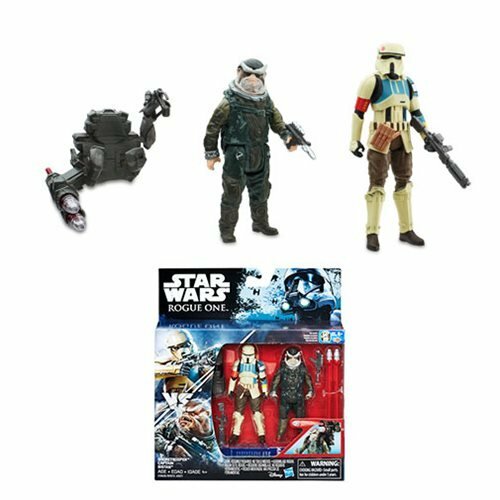 As I wrote this in advance I have no idea what - if anything - we saw for Solo last weekend, but I sincerely hope it's more fun than this figure and vehicle set. I agree that the vehicle is a little bland, but I think the figure is pretty cool. He looks good in his dark goggles and that awesome black and white helmet. The gloves are actually correct, as this figure represents the "Mounted Police" officer that pilots the speeder, and wears the goggles and has no cape. The street cops are the ones that you are mistakenly comparing to the figure. 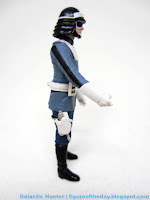 They have smaller white gloves that go under the dark blue cuffs of their sleeves. (or in some cases are not wearing gloves.) They also don't wear the goggles, but do wear the cape. I am actually trying to get a couple of extras of these figures loose, so I can customize them. The cape should be the easy part. The hard part will be dremeling out the face and putting this helmet on another head. Fixing the gloves will be a challenge too.